The editors of Pacific Review of Ethnomusicology are proud to announce the publication of our 25th anniversary issue. As a growing and dynamic graduate student-run journal, PRE has the capability to respond, push and contribute to the field of ethnomusicology in a unique way. The current issue of PRE continues the interdisciplinary and boundary-crossing traditions that have given the field of ethnomusicology its strength and vitality. "This is the second year that the editors of PRE have prepared the journal for press using techniques possible with micro-computers and laser printers. We thank our contributors who sent soft copy versions of their contributions and encourage future authors to do the same." 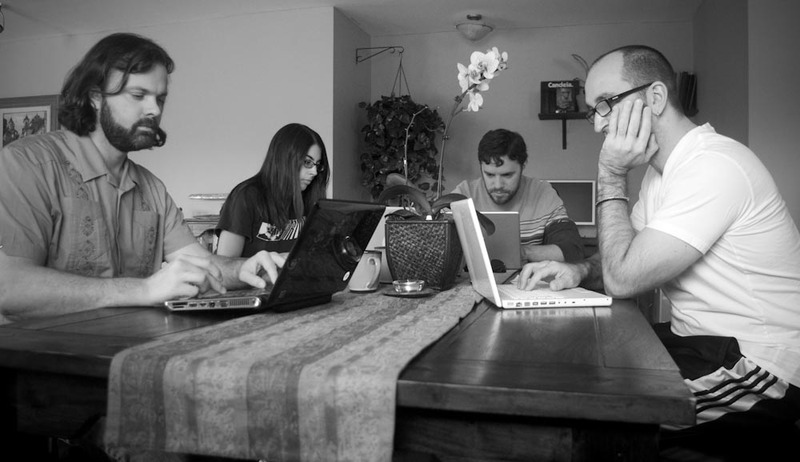 Andy Pettit, Jessie Vallejo, Nolan Warden, and Beto González, editors of PRE, at work finalizing the 25th anniversary issue using "microcomputers." Looking back from the perspective of today’s graduate students (see photo of the current editorial board at work above), it is almost humorous to imagine that the first issue was produced on a typewriter. The fact that technology has eased the burden of academic writing, researching, organizing data, and publishing speaks volumes about the tenacity of our predecessors in the field of ethnomusicology and other academic disciplines. While advances in printing technology have changed dramatically in recent years, the change to an online-only format in 2006 also speaks to the future of our discipline. With multimedia being an essential part of our field today (blogging, tweeting, facebooking, not to mention good old-fashioned audio/video recording), an online journal offers possibilities for sharing research that were unprecedented only a few years ago. As more and more peer-reviewed journals make the transition to an online format, our discipline must also consider even greater challenges concerning the environment, access, and breaking down linguistic and discursive barriers historically entrenched in our discipline. The power of technology to disseminate ideas and learning is immeasurable. In the spirit of openness PRE is now accepting articles in languages other than English. Cássio Nobre’s article “Viola nos sambas do Recôncavo Baiano” represents the beginning of PRE’s effort to engage in a truly worldwide scholarly conversation. This 25th anniversary issue also offers a chance to look back at the trials and accomplishments that make up PRE’s vital character. This issue’s Sounding Board contributor, Professor A. J. Racy, has been an active advisor since the journal’s founding and discusses PRE’s progress over tha last twenty-five years. Former editors Gordon Thompson and Wanda Bryant have contributed retrospective thoughts on PRE’s past and changes undergone throughout the years. We are also honored to include a republication of the late Nazir Jairazbhoy’s 1995 Charles Seeger lecture, originally published in PRE Volume 8, including the original audio and video presented at the lecture. The editors of Pacific Review of Ethnomusicology, past and present, look forward to another twenty-five years of academic publishing, and to the future of our discipline.